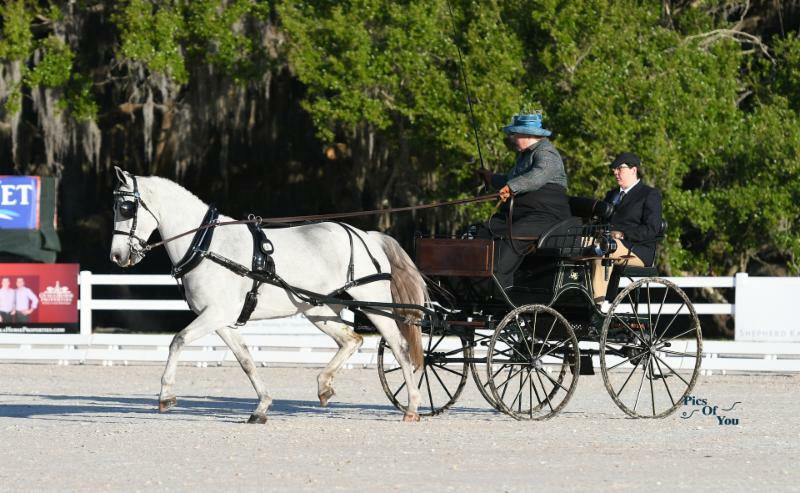 Three of the five USEF Combined Driving National Championship divisions completed their dressage tests Friday at Live Oak International with Jennifer Thompson, Kristin Whittington, and Boots Wright driving to the lead in their respective classes. This is the first year U.S. Equestrian has offered Championships at the Intermediate level, and competitors are eager to grab the inaugural titles. Thompson, Lodi, WI, took a strong lead of the Single Horse division. She drove Funnominial C.G. to the top to start the weekend on a score of 53.84. Less than a point behind in second place is Anna Koopman, Middleburg, VA, who sits on a dressage result of 54.32 with Night Chief Lms. Third place in this competitive division belongs to Wilson Groves, Brownsville, VT, and Elegant Eeyore on 58.48 points. 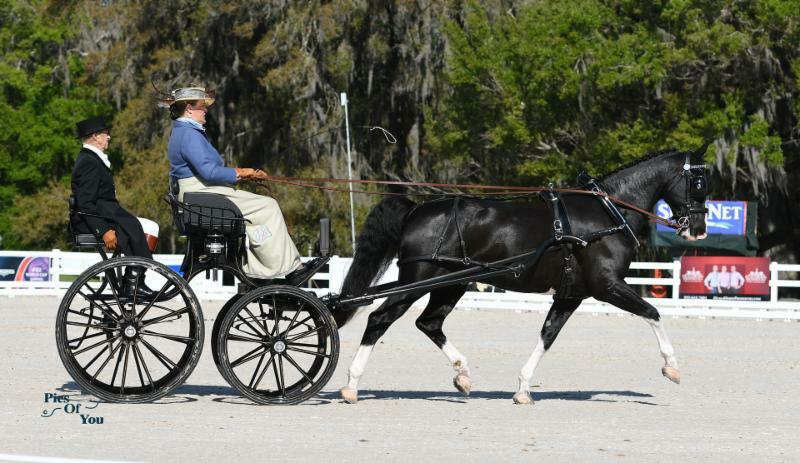 Whittington, Edinburg, IN, took the lead in the of the Intermediate Single Pony class as the final driver of the group. She and her own Symphony earned a score of 57.44. 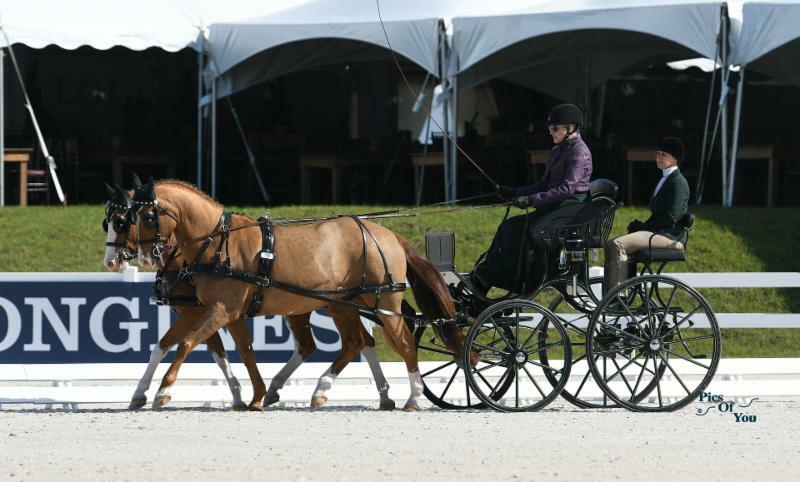 Tayler Roundtree, Ocala, FL, took second with Taylamore Prince Harry on 60.48. A score of 62.4 gave Jennifer Keeler, Paris, KY, the third place position with Zeppo. Wright, Ocala, FL, charged into the top spot of the Pony Pair Championship with a comfortable 11-point lead ahead of second-placed Katie Whaley, Paris, KY. Wright drove Marko and Mista Q to a score of 50.64. Whaley and her duo of Tommy and Teddy sit on a score of 61.76. The first two championships wrapped up dressage Thursday with Chester Weber and Scott Adcox topping the Four-in-Hand and Intermediate Pair Horse divisions, respectively. Combined drivers take on the thrilling marathon Saturday starting at 8:00 a.m. Champions will be named on Sunday with the Obstacles concluding the driving competition. Show jumping gets underway Friday afternoon beginning at 1:00 p.m. with the $10,000 Waldron Private Wealth 1.40m Power and Speed Stake followed by the 35,000 CSI3* Longines World Ranking Class Qualifier at 3:00 p.m.
Live Oak International is the only show in the United States that offers both combined driving and show jumping, attracting some of the country’s most talented riders and drivers. General admission tickets are available online and at the gate for $10. Children under 12 receive free admission. Parking for the competition is also free. For those who cannot attend this year’s event, all competition can be seen live at www.liveoakinternational.com/watch-live/. Spectators can guarantee a front row seat to the Marathon phase of the combined driving event by purchasing a tailgating spot at one of the many exciting hazards. Tailgating passes are still available and can be purchased at www.liveoakinternational.com.